Step 1: To make leaves – fold a small cupcake paper in half 2 times, and with the folded point at the bottom cut a leaf shape. 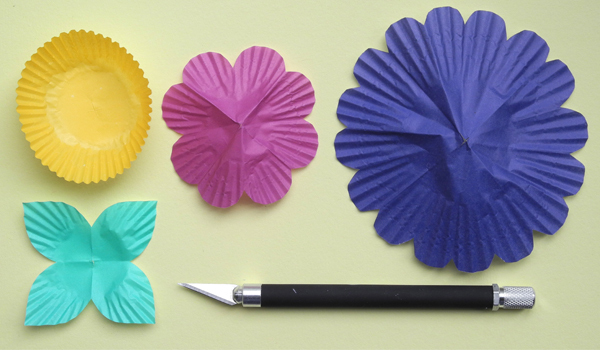 Step 2: To make an 8-petal flower – fold a small cupcake paper in half 3 times, and with the folded point at the bottom cut around the top. 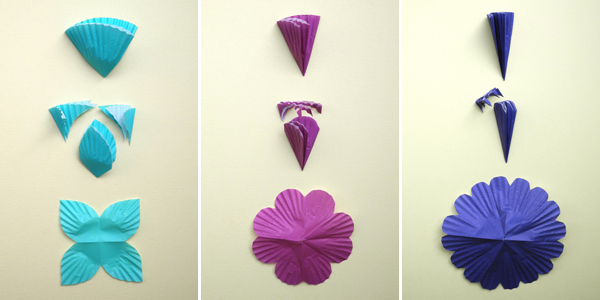 Step 3: To make a 16-petal flower – fold a large cupcake paper in half 4 times, and with the folded point at the bottom cut around the top. Step 4: Cut a small X in the center of each paper. 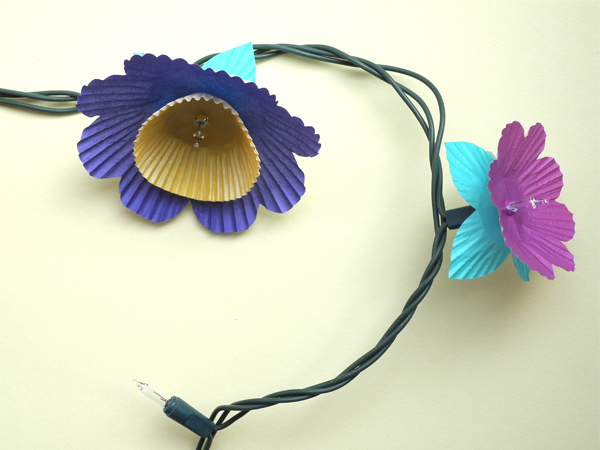 Step 5: Layer cupcake papers onto each lightbulb to make flowers. I love how pretty and festive these are and they look so easy to piece together. 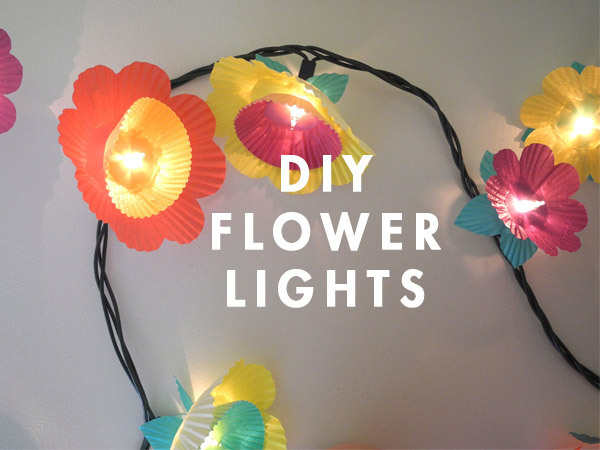 Simple diy projects that give you big results without too much effort are the best! These are adorable!! Perfect for the summer housecooling party I’ve been thinking about throwing! Again with the great ideas! Like Lizzie above, I’d also be afraid they would catch on fire. Using LED string lights would be better – no heat! They look fantastic – thanks for sharing how to get those perfect looking flowers! These are so sweet, I love them! And it is nice to see a post that is not corporate sponsored. I love comments!! I was wondering about the heat starting a fire, too – especially since you’re probably using them outside on an already warm day. LED is brilliant. You can tell I don’t buy many lights – never even crossed my mind they exist! Thanks for being brilliant, ladies!!! Modern lights don’t usually have problems starting fires. (They sit on very dry flammable Christmas trees every year.) They used to emit more heat but that is not an issue anymore. I use both LED and regular lights on lots of projects and in my opinion that shouldn’t be a problem. This so cute with the sweet color collection i so in love with them …… think to try it . Oh those are so cute. Such a good idea for a little girl’s room! Inspired by blooms around town, huh? You sure these weren’t inspired by Aunt Peaches? I know she’s put those things on lights before, just can’t find the link right now. Hi Jamie, we actually work very hard to come up with original ideas. I’ve never heard of Aunt Peaches (her flowers are cute though!) and I’ve never seen cupcake liners put on lights before. Ok brilliant as usual…will definitely try these. 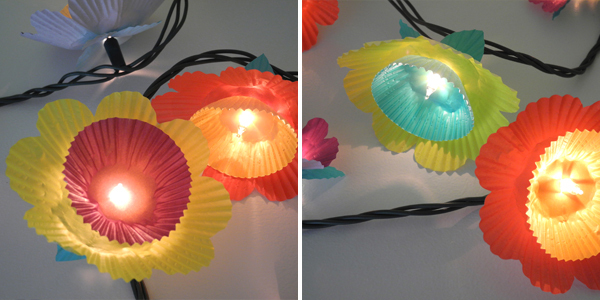 Per Jamie’s comment above, I did something with cupcake liners and lights a while back but they were not nearly as cool as THIS! Must admit, I find this funny though because someone left a similar comment on a project I made a year ago, pointing to a previous post on Ohhappyday (and I have been a fan ever since). Isn’t it funny how we all groove on the same stimulus soup in our own special way? 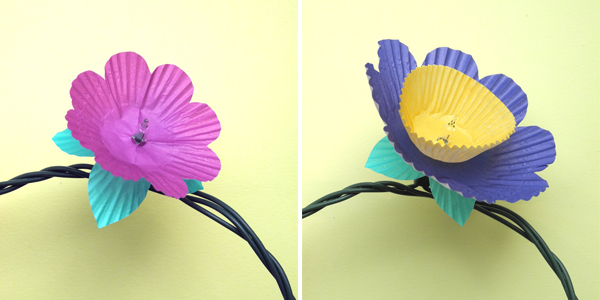 This is so awesome…now, I know what to do with leftover cupcake papers! What a great idea – very sweet! Hi Jordan, I am just found your blog via DailyBuzz Moms, as I had bookmarked your 10 Things to Do with Kids in Paris post awhile ago and just got around to reading it. I am so in love with your blog and so happy I found you. I can’t wait to read more about your adventures abroad – I’m a California gal too and my best friend is moving to Amsterdam with her family (8 month old and 5 year old) and I’m just itching for a Europe trip now. I may have to go visit my friends and stop in Paris. I am beyond obsessed with everything on Oh Happy Day and this is so exceotion. Will be doing this soon!! This is a great idea – lovely and very doable. Thank you! Love this idea and hope to use it for my twin girl’s 1st b-day. I have been looking for decor ideas and this is just perfect. Where did you find all the lovely cupcake liner colors? These are adorable. As for the fire-hazard fears, as someone pointed out above, the lights emit minimal heat. 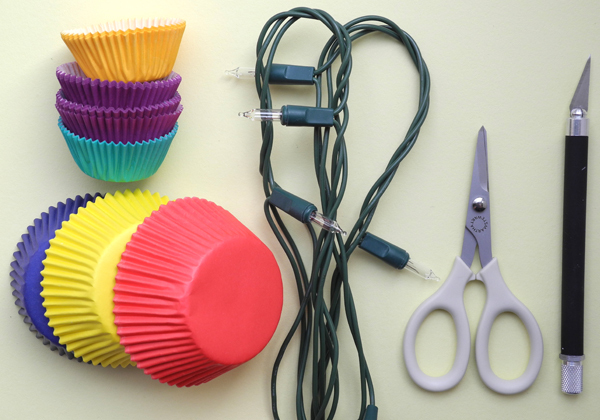 In addition, cupcake liners can withstand upwards of 500 degrees F – they are used to bake cupcakes, after all. Hi Jordan! I didn’t mean to insinuate that you don’t work hard to create original projects, sorry! In fact your blog is one of my dependable faves (along with Aunt Peaches) for amazing, original, jealousy-inducing project ideas and inspiration This just immediately made me think of an old post of hers, and rarely do I come across something on here that I feel I’ve seen before. So I was just like, “huh?”. Again, sorry for being so quick with my comment and not saying this before. I’m a big fan! Neat idea! for those worried about the fire hazard – just poke the light in further, i.e., all the way to the base of the light itself, instead of at the base of the bulb. How easy, cheap and adorable! This would be very cute for a summer tea!